“Richly Singing” and “Beautifully Nuanced” (New York Times) cellist of the Shanghai Quartet in concert with Rieko Aizawa, pianist of the Horzowski Trio. “Simply spectacular” (The Advocate), award winning violinist with the Chamber Music Society of Lincoln Center in concert with pianist, Jeremy Jordan, a Young Steinway Artist. 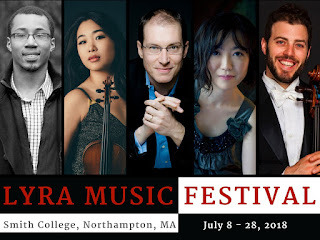 Lyra Music Faculty Artists are international performers and artist educators. Join us for an intimate concert of chamber music.